Subsection (b) of this section consists of definitions of terminology used in the standards that comprise this section. An amendment to add a definition for the term “single-rail ladder” was added. This definition will clarify to the employer the meaning and application of the proposed standard prohibiting single-rail ladder use in new subsection (d). An amendment for Section 3276(d)(1) which pertains to the selection and use of portable ladders to add language that prohibits single-rail ladder use. The amendment will require employers to use conventional two rail portable ladders. but also its ability to do business. Revised hours-of-service (HOS) rules announced by the Department of Transportation’s Federal Motor Carrier Safety Administration (FMCSA) are now in place. The new rule reduces to 70 hours – a 12-hour reduction – the number of hours a driver can work during a seven-day week, but keeps the 11-hour daily driving limit – a move strongly opposed by the American Trucking Assn. (ATA). I just got off the phone with Employer Smith. I have never talked to him before; he had seen our website and just called with a "quick question." I should have told him that there are few quick answers in the law. Due to overwhelming demand, the Association of Equipment Manufacturers (AEM) has printed a limited supply of new safety decals for rough terrain forklifts. 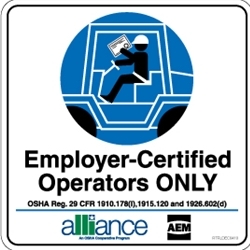 This new decal - "Employer-Certified Operators ONLY" - was developed by AEM and approved by the U.S. Occupational Safety and Health Administration (OSHA). The decal signifies that the machine should be operated only by personnel who have received employer certification of training and evaluation according to relevant OSHA standards. The California Department of Industrial Relations' Division of Occupational Safety and Health (Cal/OSHA) is investigating several incidents involving a man impersonating a Cal/OSHA inspector and suspected of defrauding restaurant owners. Several similar incidents have occurred across Southern California, in the costal region near Santa Barbara and in Roseville. An investigation is ongoing and is being coordinated with local law enforcement where the incidents occurred. DPR amended sections 6000, 6720, 6738, and 6793, and adopted section 6739 of Title 3, California Code of Regulations. See: http://www.cdpr.ca.gov/docs/legbills/calcode/chapter_.htm. The regulatory action pertains to respiratory protection worn by employees working with pesticide materials. In summary, the action revised the written respiratory protection program that employers must establish when employees are required by pesticide label, restricted materials permit, or regulation to use respirators in the workplace.